Today marks the 73rd Liberation Day and the 70th anniversary of the establishment of the Republic of Korea government. It is a truly significant and joyous day. Thanks to the sacrifices and devotion of our forefathers who fought for independence, we are able to celebrate here today. I pay tribute from the bottom of my heart. My respect also goes to those who served the cause of independence with distinction and their bereaved families. Starting with volunteer righteous armies opposing imperialist Japan in the late Joseon era, our independence movement turned into fierce struggles to restore popular sovereignty following the March 1st Independence Movement in 1919. With the Provisional Government of the Republic of Korea at the center, unyielding campaigns aimed at building our nation with our own hands were waged. The history of pro-Japanese collaborators was never a part of our mainstream history. The struggles of the Korean people for independence were more relentless than those in any country around the world. National liberation was not given simply from the outside. It was the result of the victories of forebears who fought together, risking their lives. It was the liberation achieved by all the people who pooled their strength equally. For this reason, on the day when Korea was liberated, all Koreans came together cheering passionately for Korea’s independence. We deserve to have a great sense of pride in the fact. To celebrate Liberation Day today, we are gathered here in Yongsan, in the heart of Seoul, which has been returned to the arms of the people after 114 years and finally become an integral part of our territory. During the Japanese colonial period, Yongsan was a Japanese military base and at the center of the exploitation and subjugation of Joseon. Immediately after liberation, the history of the ROK-US alliance began in Yongsan. Since the end of the Korean War, Yongsan has served as the foundation for maintaining peace on the Korean Peninsula. The relocation of the US Forces Korea headquarters to Pyeongtaek in June this year enabled the ROK-US alliance to usher in a new era to become as strong as ever. Now this part of Yongsan will be turned into an ecological park akin to Central Park in New York. It will become possible to earnestly implement the 2005 plan to create a national park. My heart leaps with pleasure imagining a vast-sprawling ecological park serving as lungs in the center of Seoul, the capital of the Republic of Korea. It is all the more meaningful to hold this ceremony celebrating Liberation Day today here in Yongsan, a place steeped in our painful history and symbolic of our determination for peace and a prosperous future. Just as Yongsan had long been taken away from us, what awaits us are the legacies of the Korean independence movement that have yet to be identified and claimed. In particular, the role of women in the independence movement has been kept even more deeply in the dark. Even though women were severely discriminated against due to patriarchy as well as social and economic inequalities, they committed themselves to the independence movement with an indomitable resolve. Female worker Kang Ju-ryong at the Pyeongwon Rubber Factory in Pyeongyang staged a protest on the roof of the 12-meter-high Eulmildae Pavilion in opposition against unilateral wage reduction by imperialist Japan in 1931. She cried out for the liberation of women and the liberation of labor. At that time, the wages of male workers in Joseon were not even close to half of what Japanese workers got paid, and Joseon female workers earned less than even half of their male counterparts. Her do-or-die resistance resulted in her death two months after her release from prison. She was posthumously awarded in 2007 the Patriotic Medal under the Order of Merit for National Foundation. In 1932, Gujwa-eup on Jeju Island was the epicenter of female divers’ anti-Japanese resistance sparked by five divers: Ko Cha-dong, Kim Gye-seok, Kim Ok-nyeon, Bu Deok-nayng and Bu Chun-hwa. The anti-Japanese movement spread among 800 female divers, and approximately 17,000 women joined 238 rallies in total during the three months. Now a monument to the Jeju female divers’ anti-Japanese movement stands in Gujwa-eup. Over the past year since last year’s Liberation Day, the government has identified 202 female independence fighters and had their names proudly registered in the history of liberation. Among them, 26 patriots have been chosen for the conferment of honors and decorations today. The remainder will continue to be honored. Any endeavor made for liberation will certainly be given due credit and legitimate esteem. The government will identify more accounts of the independence movement without any discrimination on the basis of one’s gender or role. I believe that the complete identification of the independence movement’s unknown history and independence activists will be the consummation of yet another liberation. The Republic of Korea was built by people of different backgrounds contributing what they could. Today marks the 70th anniversary of the founding of the government of the Republic of Korea, and our country has now become a proud nation in the world. 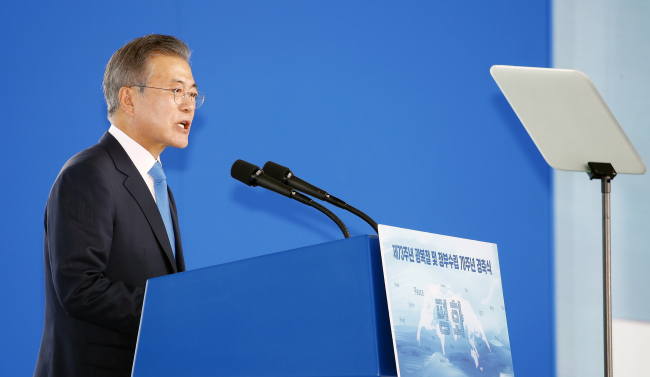 Among nations that achieved independence from colonial rule following World War II, Korea is the only country to succeed in achieving both economic growth and democratic progress. One of the dozen or so largest economic powerhouses and the country that astonished the world by resuscitating democracy through a candlelight revolution -- this is what Korea is today. It is a remarkable feat achieved after having overcome numerous hardships, including national division, a horrendous war, intense confrontations between the South and North, absolute poverty and military dictatorship. Though there is still much room for improvement, no one could deny the fact that few countries have achieved such dynamic development as ours. It was made possible thanks to not only our forefathers but also all the generations living in this age. We Koreans have a tendency to underestimate our status and capabilities. As anyone can realize when traveling abroad, however, Korea is now a successful country, one that many countries envy and look to emulate. In this regard, I hope that we all have a sense of pride. On the strength of such pride, we have to make progress in the coming 70 years. Taking responsibility for our fate ourselves, we are now moving forward toward peace and prosperity of the Korean Peninsula. This is a way to overcome division. Even after the war, division caused the horror of war to take root in our everyday lives. It took away the lives of countless young people, incurring enormous economic costs and loss of capabilities. The development of northern sections of Gyeonggi and Gangwon provinces was restricted, and the residents on the five islands closest to North Korea in the Yellow Sea couldn‘t fish in abundant waters just offshore. The division made the Republic of Korea an island disconnected from the continent. It even engendered a division in our thinking. Many taboos blocked freedom of thought. The division became a pretext for the military dictators who touted national security. It also served as justification for intensifying ideological conflicts that split the people as well as politics marked by tendencies to stigmatize someone based on ideology or resort to the ingrained regional divide. It also became a sort of hotbed of corruption and unjust privilege. We must overcome division for our survival and prosperity. Even though political unification is still far away, building a single economic community first by settling peace and freely travelling back and forth between the two Koreas will become genuine liberation for us. Now I am walking together boldly with the people down a path made possible entirely thanks to their support. Many people in the 17 cities in 11 countries that I visited after taking office expressed profound respect for the people of Korea, who revived democracy and justice through candlelight rallies and now strive to build a properly functioning country. This sentiment has served as a strong force for me to secure international support. I first met with US President Donald Trump and agreed to develop the ROK-US alliance into an “even greater alliance.” We also agreed to resolve the North Korean nuclear issue in a peaceful manner. The leaders of the G-20, including German Chancellor Angela Merkel, have expressed their full support for my administration’s efforts. I came to an agreement with leaders of ASEAN (Association of Southeast Asian Nations) countries to work together to create a peace-loving community where all people prosper together. President Xi Jinping of China and I agreed to further develop the strategic partnership between the two countries. As of now, China is playing a significant role in promoting peace on the Korean Peninsula. Russian President Putin and I agreed to join forces to prepare for trilateral cooperation among the South, the North and Russia. Japanese Prime Minister Abe and I reached an agreement to closely cooperate to develop Korea-Japan relations in a forward-looking manner and to promote peace and prosperity on the Korean Peninsula and in Northeast Asia. This cooperation will eventually lead to the normalization of North Korea-Japan relations. On the strength of such international support, the Panmunjom Declaration was adopted by the joint efforts of the two Koreas. South and North Korea agreed to completely cease all hostile acts against each other in every domain, including land, air and sea. Now, the two Koreas have restored regular communication channels between military authorities and are in contact on a daily basis. The Yellow Sea, dubbed the sea of conflict, has now turned into a sea of peace where military threats have disappeared and common prosperity is being pursued. Demilitarizing the Joint Security Area in Panmunjom and the withdrawal of guard posts in the Demilitarized Zone on a trial basis were agreed upon in principle. The South-North joint excavation of the remains of those killed during the (Korean) War will also be carried out. Reunions of families separated by the Korean War have also resumed. A South-North Korea joint liaison office, which is expected to develop into a permanent mission for both sides, will be established for the first time going forward. This is very meaningful. In a few days, an era in which the two Koreas communicate with each other around the clock will commence. The North Korea-United States summit was also achieved with the determination of those two nations to walk the path of peace and prosperity together. Peace and prosperity on the Korean Peninsula is a promise shared between their two leaders and the world. I hope that the implementation of the complete denuclearization of North Korea and corresponding comprehensive measures by the United States will be pursued quickly. At the high-level inter-Korean meeting held two days ago, it was agreed that the fall inter-Korean summit, as promised in the Panmunjom meeting, will go forward. I will be visiting Pyeongyang next month bearing the wish of the people. We two leaders will confirm the implementation of the Panmunjom Declaration and take an audacious step to proceed toward the declaration of an end to the Korean War and the signing of a peace treaty as well as the complete denuclearization of the Korean Peninsula. When the deep-rooted distrust between the two Koreas and between the North and the United States is lifted, the mutual agreement can be implemented with sincerity. I will help build a relationship based on deeper trust between the two Koreas and simultaneously lead efforts to promote dialogue on denuclearization between North Korea and the United States. I believe in the importance of recognition that we are the protagonists in Korean Peninsula-related issues. Developments in inter-Korean relations are not the by-effects of progress in the relationship between the North and the United States. Rather, advancement in inter-Korean relations is the driving force behind denuclearization of the Korean Peninsula. This is borne out by history: When inter-Korean relations were good in the past, North Korea’s nuclear threat was eased and a denuclearization agreement was reached. When peace is established on the Korean Peninsula along with complete denuclearization, economic cooperation can be carried out in earnest. When the dreams of a peace-based economy and economic community are realized, our economy can take a new leap forward. The day when all Korean people are prosperous together will also be advanced. According to research by a state-run organization, the impact from inter-Korean economic cooperation is estimated to reach 170 trillion won ($150 billion) at a minimum over the next 30 years. This outcome stems from the combined effects of reconnected inter-Korean railroads and certain natural resource development projects in addition to the resumption of the operation of the Kaesong industrial park and Kumgangsan tours. When the two Koreas undertake full economic cooperation, the result will be incomparably greater. We have already experienced Kumgangsan tourism generating 8,900 jobs and enabling rapid economic growth in Goseong-gun County, Gangwon Province. The Kaesong industrial park was a rich repository of jobs, employing over 100,000 people. Exceptional development like the sea change in the Paju region was achieved when the two Koreas were at peace. “Peace is the economy”; peace and the economy are synonymous. When military tension is eased and peace established, special unification economic zones will be built in the border areas of Gyeonggi and Gangwon provinces. It will be an opportunity for those regions and small and medium-sized enterprises to make huge progress in addition to the numerous jobs created. It is a goal to hold groundbreaking ceremonies within this year for the reconnection of railroads and roads as agreed in the Panmunjom Declaration. The reconnection of railroads and roads is the beginning of mutual prosperity on the Korean Peninsula. The European Coal and Steel Community was created in 1951 by six European countries with the goal of preventing wars, establishing peace and rebuilding the economy. The community later gave birth to the European Union. At Yongsan, once the starting point of railroads between Seoul and Sinuiju and between Seoul and Wonsan, I propose the creation of the East Asian Railroad Community today, encompassing six Northeast Asian countries and the United States. The community will expand the horizon of the Korean economy to the northern part of the continent and become the main artery of mutual prosperity in Northeast Asia. It will then lead to the creation of East Asian energy and economic communities. Moreover, it will initiate a Northeast Asian multilateral peace and security system. Our people have done their best at every moment as they achieved liberation from colonial rule, overcame the Korean War and accomplished democratization and economic development. The people have accomplished miracles, and the Republic of Korea is becoming a more equitable and just nation. Patriotic martyrs who fought for liberation and the people encouraged each other and prevailed over hardships in the hope that liberation would certainly come. Though difficult processes such as the denuclearization of the Korean Peninsula and economic revitalization await us, there is nothing to fear if we join hands together as we always have. Peace and prosperity on the Korean Peninsula depends on what we do forthwith. I believe in the power of optimism. The courage and determination that helped achieve liberation earlier will bring us true liberation characterized by peace and prosperity going beyond the division.